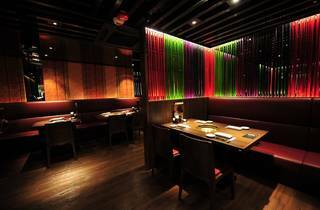 Gyu-Kaku’s migration to Hong Kong should have happened years ago. 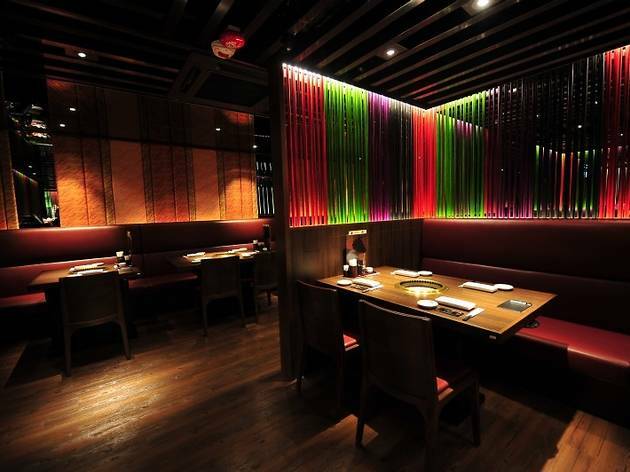 After all, the Japanese grilled meats chain already boasts more than 700 restaurants across the globe, with outlets spanning from Japan to America, Singapore and even Indonesia. But better late than never, we guess, as the beef-bragging brand set up their first Hong Kong branch in Kowloon Bay last month. The restaurant’s picture-heavy menu encourages over-ordering. We tried to stay on the light side with our appetisers, beginning with the leafy seaweed salad ($49). We tossed the leaves and nori with the nutty sesame dressing, which was mixed with bits of jellylike collagen. Not particularly inspiring, but necessary to take the edge off our carnivorous guilt. We also tried two chilled tofu dishes. The first arrived in a mild spicy red sauce with a poached egg and a pile of chopped scallions ($39). This was light and creamy but lacked any discernable depth of flavour. It was the second block of curd that sent us swooning as it wobbled under a mound of chilli oil-drenched chopped leeks and garlic ($19). Following the trio of cold dishes, we took a stab at the Korean-influenced part of the menu, which listed hearty bibimbap and stonepot soups. The seafood soup ($69) was surprisingly satisfying with scallops, prawns and silken tofu swimming in the spicy kimchee broth. But the star at Gyu-Kaku is the beef. The Japanese wagyu short ribs ($99) came two slabs to a plate, marinated in shio tare (salt sauce). The thick cut needs about half a minute on the grill to brown on both sides. We snipped each slab into three pieces to reveal the thin strip of medium-rare pinkness and tried them with each of the different condiments – sweet mirin sauce, fresh lemon juice and Gyu-Kaku’s “miracle salt” paste. While we loved the deep, gamey flavour, we found ourselves gravitating more towards the cheaper short rib – the premium karubi ($59). Slightly thinner than the wagyu, this fat-marbled cut needed only a quick few seconds over the fire to transform it into a meltingly tender piece of umami goodness. A light drizzle of lemon was hands-down the best way to enjoy this, with the tart citric acid cutting right through the fat, lifting the meat’s natural taste. We tried another short rib ($49), which was coated in a miso marinade that left a caramelised crust on the beef when grilled. The dipping sauce made with beaten raw eggs emphasised the miso-induced sweetness and filmed the bite-sized pieces in a lustrous, yolky creaminess. The salt-marinated beef tongue ($49) seemed less enthralling compared to the orders of short ribs. The millimetre-thick slices frilled up quickly over the fire but as a firm cut of meat better suited to slow, softening methods of cooking, grilling left it crunchy, with an almost gizzard-like texture. We also tried the premium skirt steak ($69), which came with salted butter for patting over each side, post-grilling. This ran a close second to the premium karubi with its intense, full flavour. Offal fans will be happy to know that Gyu-Kaku offers four different types of innards. Beef liver ($39) is a standout, grilled until the crunchy exterior fully envelopes the soft, pâté-like inside and drizzled with a squeeze of lime to set off its bold, earthy flavour. The restaurant’s ice cream desserts are a must after the meat feast. The Gyu-Kaku ice cream ($19) is an easy crowd-pleaser, covered with a blanket of sandy soybean flour and black sugar syrup. More interesting though are the grillable items of red bean pancake ($19) and maple syrup-drizzled puff pastry ($29), which is quickly scalded over the fire before being slopped with mid-melting ice cream. open soon in Tsim Sha Tsui, and four more branches planned before the end of 2013, it looks like Gyu-Kaku is making up for lost time. Shop 429, 4/F, Telford Plaza 2, Kowloon Bay, 3101 0128. Daily noon-11pm. Meal for two: around $500.